The UA Alumni Association chapter and club network builds a connection between alumni locally and across the U.S. by strengthening the bridge between the Wildcat Nation and the University of Arizona. 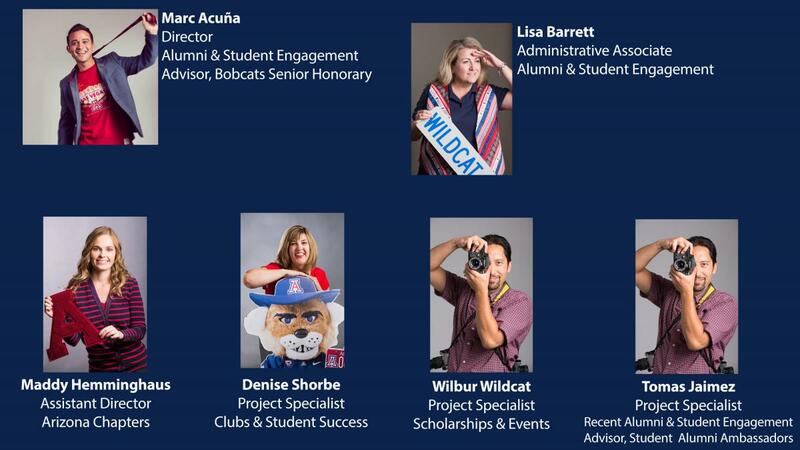 Through meaningful, impactful, and diverse events, as well as communication and leadership, chapters and clubs are an invaluable resource and active stewards of the Wildcat for Life tradition. As keepers of the flame, our chapters and clubs act as connectors and mobilizers while influencing alumni engagement and action. Stay tuned for information on the 2018 conference. If you're unable to locate the page, contact Marc Acuña so he can add you to it. It is important to remember that your wordmark must be used as a stand alone graphic and not combined with any other university logo. Official groups have no restriction on logos for re-sale items, which carry a 12-percent royalty. For official group promotion or giveaway items, which don’t bear a royalty, groups are restricted from using logos outside the University or UAAA brand (i.e. : UA Athletics logos). Essentially you may only use the block a, wildcat face, UAAA logos, and verbiage not in the UA Athletics font. Any third party logos i.e. businesses co-branded with the UAAA or group brand bears a 15-percent royalty and logos are restricted to the UAAA and University logos. Official groups are required to utilize an approved and licensed vendor. If you have questions and would like to seek approval of design or concept, contact UA Trademarks and Licensing office at (520) 626-3077 or licensing@arizona.edu. Scholarships — Please contact Rebecca Determan (rebecca.determan@al.arizona.edu) with any questions.